Wooden yardsticks are a very popular free giveaway item at trade shows, conventions, home or boat shows, county or state fairs, etc. to help booth traffic. A printed yardstick is very visible in a large location or gathering and provides billboard advertising for the user, helping to bring people to their location. Use it as a pointer or wooden ruler. Call 706-374-0710 for a FREE quote and to put our years of advertising experience to work for you. Wooden Yardsticks are an appreciated free gift to take home during grand opening weekends or special events. As they are long lasting they provide an excellent promotional and advertising value. Use promotional yardsticks in fund raising as a thank you for a donation. Incorporate a slogan such as "I went the Extra Yard for ...". "For Quality and Service that Measures Up!" "By any Measure our Quality is the Best!" "We'll Go the Extra Yard!" "We Go to ANY Length to Serve You!" "Your Satisfaction Measures Our Success!" Imprint colors available are black, red, light blue, dark blue, green, brown, orange, maroon or purple; however, black is recommended. Our Wooden Yardsticks are proudly made in the USA. Advertise on these natural finish yardsticks. Same imprint and scale is printed on both sides of the stick in one color ink. Pricing includes imprint of up to 110 characters and spaces. English scale. Standard yardstick length is 5/32"x1-1/8"x36". Maximum logo height is 1/2". Exceptional value in clear lacquer finish. Same imprint and scale is printed on both sides of the stick in one color ink. Pricing includes imprint of up to 110 characters and spaces. The above picture of a yardstick reflects the English scale. Yardstick is 36 inches long, and 5/32"x1-1/8"x36". Maximum logo height is 1/2". Colorful advertising on enamel finish yardsticks. Same imprint and scale is printed on both sides of the stick in one color ink. Pricing includes imprint of up to 110 characters and spaces. English scale. 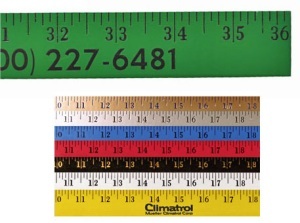 Yardsticks available in green, gold, silver, blue, red, black, white, yellow or assorted (with black imprint). 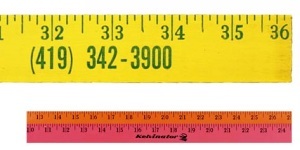 Yardstick is 5/32"x1-1/8"x36". Maximum logo height is 1/2". Bright advertising on vibrant neon colored yard sticks. Same imprint and scale is printed on both sides of the stick in one color ink. Pricing includes imprint of up to 110 characters and spaces. English scale. Yardsticks book colors are available in neon yellow, neon orange, neon pink or assorted (with black imprint). Yard stick is standard length of 36 inches or 5/32"x1-1/8"x36". Maximum logo height is 1/2". For all yardsticks, pricing includes straight-line ad copy printed in one color on both sides (same imprint). An additional $55 non-refundable artwork/proof charge per color must be paid before work can begin. Since a paper product proof is provided on our wooden yardsticks, any changes requested after first proof will require additional $50 proof charge. For logo or special type style, add $30 per color (for every 3" in length). Contact us for multi-color imprint. Wooden Rulers - Print your personalized advertising on a 6-inch or 12-inch wooden ruler. Name identification can be increased by offering a useful item such as our wooden yardsticks. If people see your name on a repetitive basis, they soon learn your name and become familiar with it. After becoming familiar with your name, and you have the high recall in their mind, they become comfortable voting for you or doing business with you. People do not feel comfortable voting for a stranger. Increasing your Name Identification -- the most important purpose of a political advertising campaign. Custom printed yardsticks, a product they will want to keep, and your name will be deeply impressed in their mind for many occasions to come.